All young children and their families deserve access to high-quality early education and care, which is why the Board of Mesa County Commissioners adopted a proclamation to focus attention on the needs of young children and their families by recognizing and drawing attention to multiple initiatives and programs in the Grand Valley intended to make children’s lives better. The Board proclaimed April as Month of the Young Child in Mesa County. 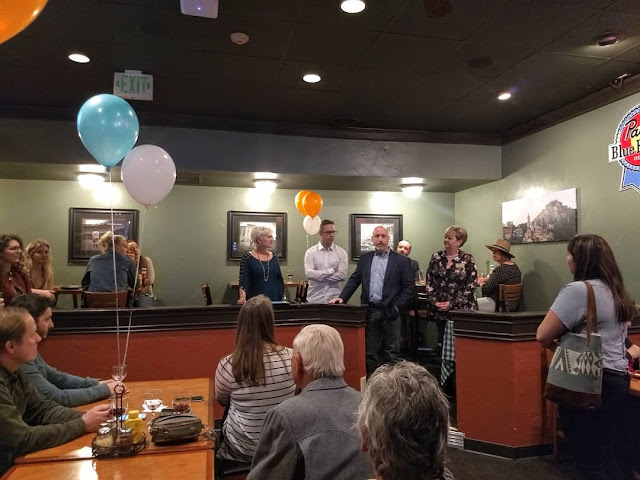 Kirk Huddleston, center left, and Coreen Edwards, center right, owners of local childhood learning centers, accepted the proclamation in public hearing on April 8, 2019. Read more at https://bit.ly/2U9B1uo. Road Supervisor Rudy Bevan and Engineering Technician Matt Nichols briefed the Board of County Commissioners on a contract for this year's overlay projects with United Companies of Mesa County. The item and public hearing video are available at https://bit.ly/2Gn6fu6. For the 9th year in a row, the Purple Team in the Economic Assistance Division of the Department of Human Services (DHS) has assembled Easter Baskets to be given to children served by Strive, as a fun and meaningful way to give back to our community. 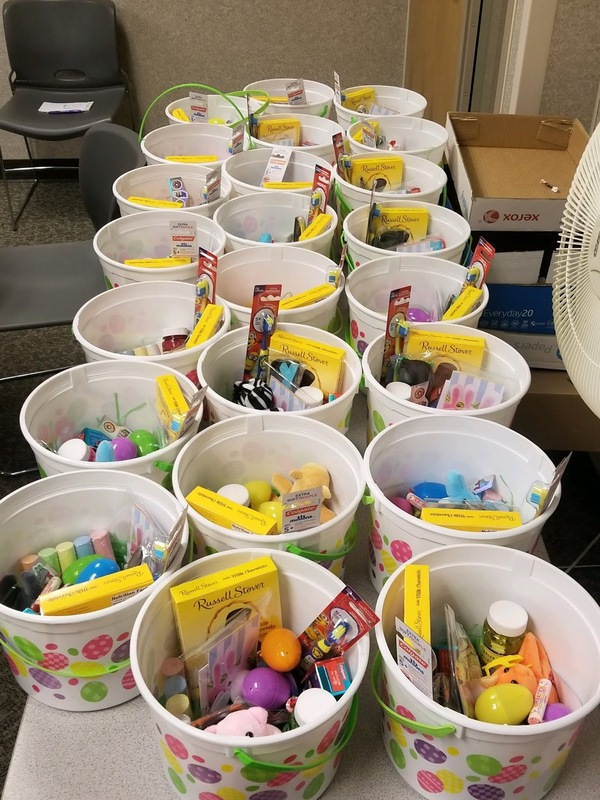 Here is a picture of the completed Easter Baskets which will be given to children served by Strive. 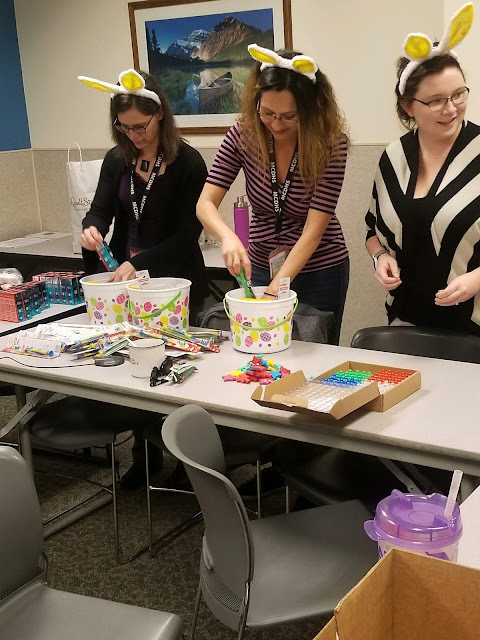 This year, media joined DHS to highlight the special event as the baskets were delivered to Doug Sorter, Vice President of Development at Strive, and several other appreciative staff. 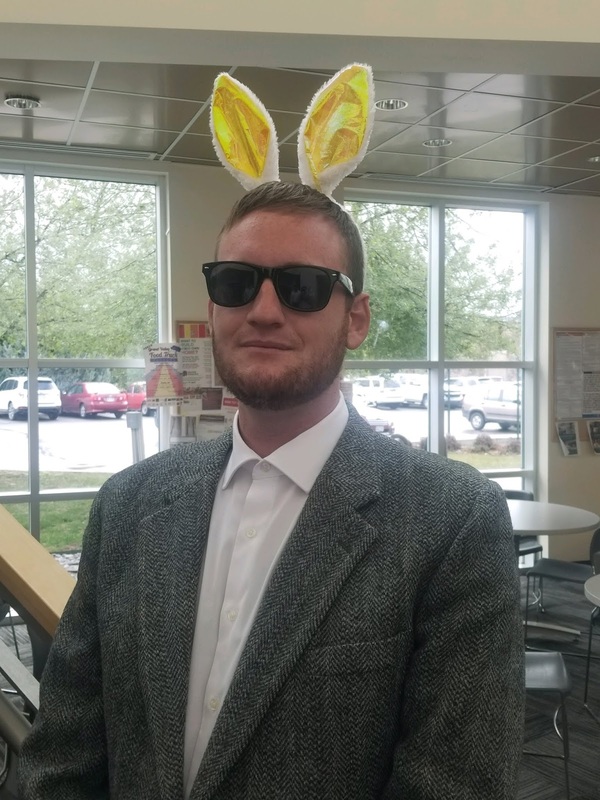 Watch the interview at https://www.westernslopenow.com/news/local-news/strive-and-mesa-county-team-up-for-easter/1922981426. 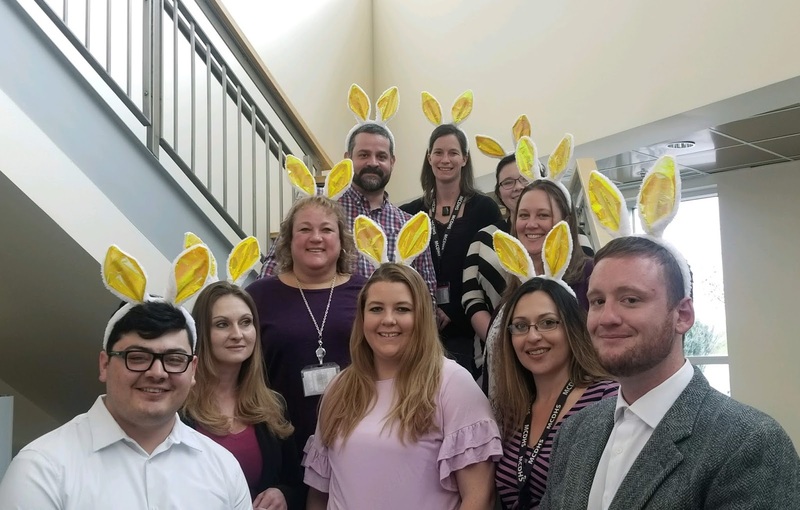 Thank you, Purple Team, for your contribution to children in need in the Grand Valley! The coolest rabbit of them all—John Bauer. 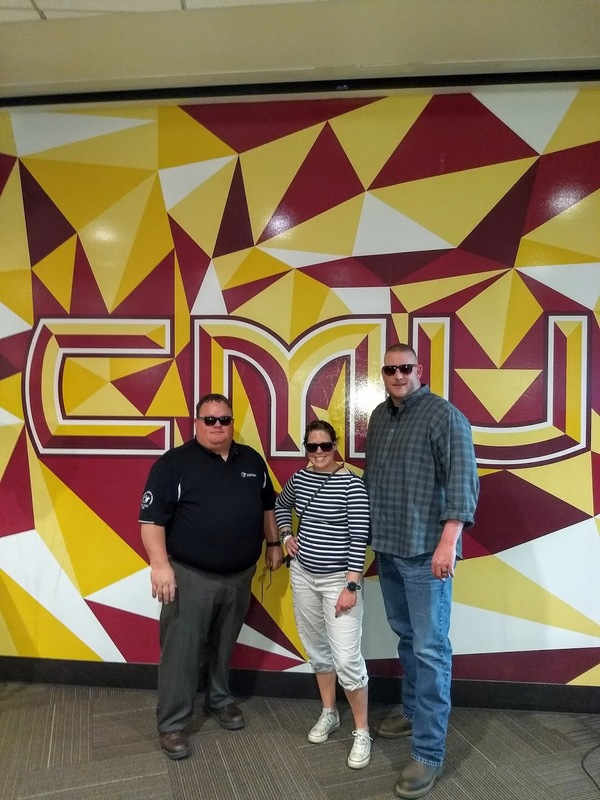 Grand Valley Transit (GVT) General Manager Valdon Lewis, Regional Transportation Planning Office (RTPO) Mobility Manager Sarah Brooks and Community Development & GVMPO Director Todd Hollenbeck attend the Dash kick-off event. Various Dash partners spoke at the kick-off event. So what is Dash? 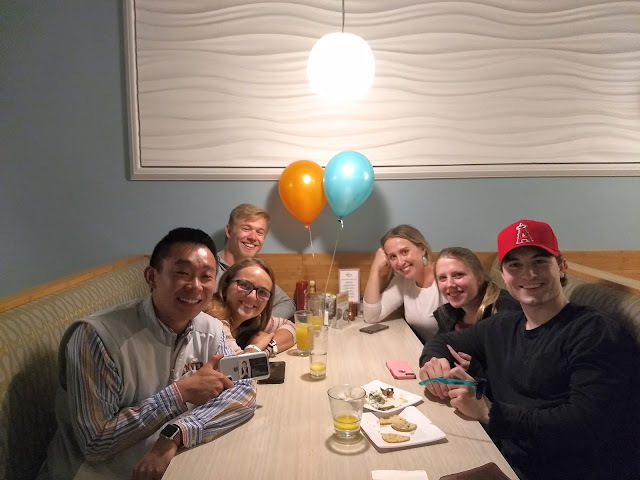 It's a local shuttle that connects you for FREE between the Grand Junction Regional Airport, Horizon Drive, Colorado Mesa University, and Downtown Grand Junction. For more details, visit DashGJ.com. 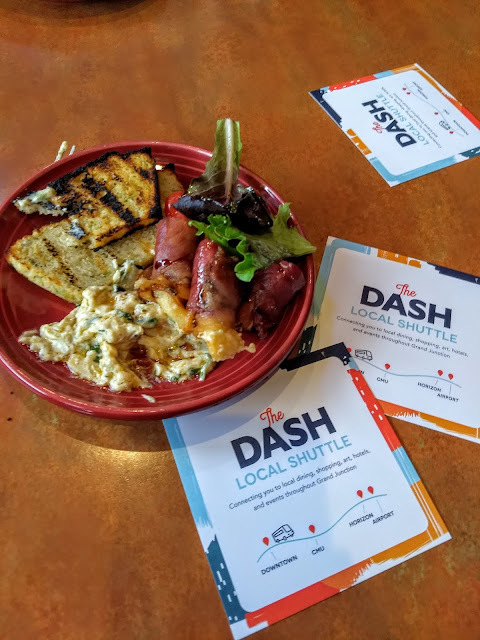 Have you seen the Dash promo at your local downtown restaurants? Catch a FREE ride on The Dash every Thursday, Friday, and Saturday from 4:15 pm – 12:15 am. Learn more at DashGJ.com. Many Colorado Mesa University students from the marketing department participated in the Dash kick-off for class credit and did a variety of social media posts, including Snapchat and IG using #dashgj and #ridethedash. Roice Hurst Humane Society showed their appreciation for the Mesa County Animal Services staff in honor of National Animal Control Officer Appreciation Week. Roice Hurst works closely with Animal Services to promote animal and community health. The construction team, with Mesa County Road and Bridge, has helped reclaim the site at 29 Road to turn it into a parking lot providing better access to the trail along the river. Residents can now enjoy free parking and easy access to the Riverfront Trail. Mesa County Administrator Frank Whidden presented to the Grand Junction Chamber of Commerce Mesa County Leadership Class Thursday morning on the internal operations and functions of local government. During his presentation to the chamber class, County Administrator Frank Whidden discussed how the county is organized and ways community members can get involved in local government. Mesa County GIS Administrator Ryan Davidson shared with class participants how Mesa County develops and manages its geographic information system. Mesa County District Attorney Dan Rubinstein spoke to the Mesa County Leadership Class about the functions and responsibilities of his office and gave a brief agency update. Learn more about the DA's office at https://da.mesacounty.us/. Mesa County Commissioner Rose Pugliese gave a presentation to chamber class participants on the effects this legislative session will have on the county. Mesa County Commissioner Scott McInnis spoke to the chamber class about the projects he is working on. Mesa County Commissioner John Justman spoke to the class about the importance of diversity within the Board of Mesa County Commissioners. He mentioned his colleagues are both lawyers and he offers an important and different perspective due to his agriculture and farming background. Mesa County Assessor Ken Brownlee spoke to the Mesa County Leadership Class about the appeals process. Learn more about the Assessor's Office at https://assessor.mesacounty.us/. Mesa County Treasurer Sheila Reiner spoke to the Mesa County Leadership Class about her role as an elected official. She also reminded them that property taxes are due in full by April 30. Mesa County Sheriff Matt Lewis shared with the Mesa County Leadership Classis that his agency is responsible for public safety in the 3,300 square miles of the county. They respond to 911 calls and conduct criminal investigations, and other duties, which include operating the Mesa County Detention Facility, providing security at the Mesa County Justice Center, search and rescue operations, emergency management, and wildland firefighting. Mesa County Clerk and Recorder Tina Peters spoke to class participants about the various divisions she oversees within her office, i.e., Motor Vehicle, Elections and Recording. Mesa County Coroner Victor Yahn gave the class an overview of the responsibilities and functions of his office. The Coroner's Office is mandated by Colorado Revised Statutes and is a separate and independent organization, which conducts investigations into the cause and manner of a person’s death. Learn more at https://coroner.mesacounty.us/. Mesa County Workforce Center Director Curtis Englehart spoke to the Mesa County Leadership Class about current local economic indicators. Deputy Administrator of Operations Pete Baier highlighted Public Work's accomplishments for the previous year and presented an overview of infrastructure and road projects for 2019 to the class. 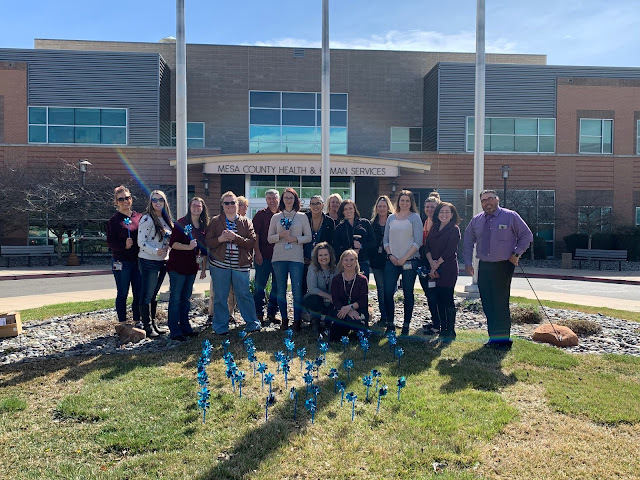 DHS Child Welfare staff planted pinwheels in front of the Community Services Building, 510 29 1/2 Road, in recognition of Child Abuse Prevention Awareness Month. 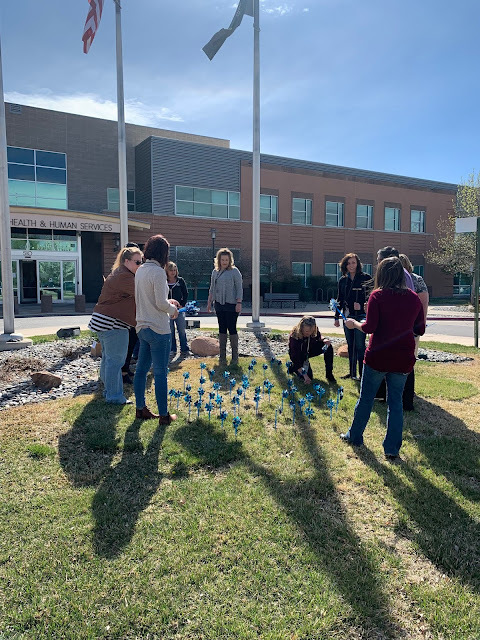 Staff participated in the annual pinwheel planting in recognition of National Child Abuse Awareness Month. Call (970) 242-1211 to report abuse or neglect in Mesa County. 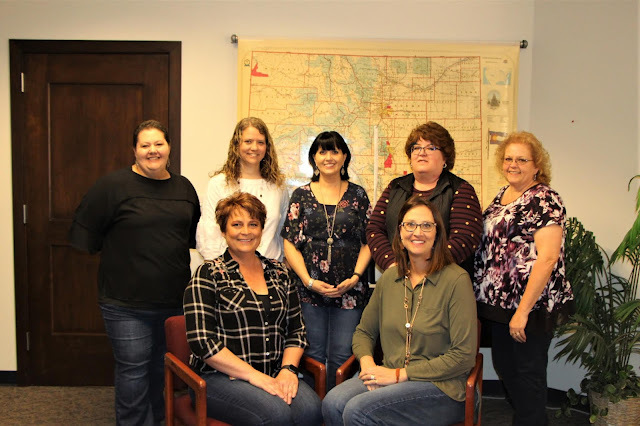 The Mesa County Treasurer's Office is now fully staffed! The Treasurer's office has not been fully staffed since about 2014. Pictured here from left to right: Bobbie Gross, Karen Reiher, Leah Hankins, Amy Bosse, Christine Horner, Sheila Reiner, and Jackie Campbell. 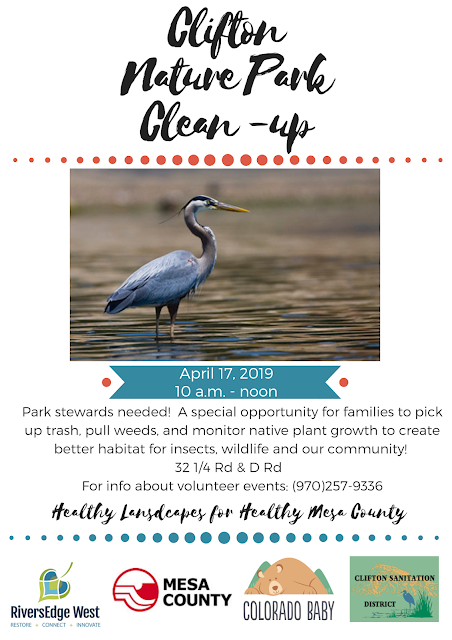 Since the recent news of mercury being brought to a local elementary school, Mesa County Hazardous Waste Collection Facility has accepted several bottles of the metal from residents cleaning out their households. Mercury is a very dense substance—the amount in these partially filled bottles weighs almost 10 pounds! Teresa Nees with Mesa County Hazardous Waste Collection Facility carefully packs pure mercury and mercury-containing items like thermometers and thermostats into appropriate containers for shipment. These items will be sent to a facility for recycling, processing, or appropriate disposal. Lambie is ready for the Mesa County Fair!